Bullet Balls are precise diameter and weight polymer balls, available in five color-coded diameters, which can be used to make lighter-weight bullets by taking up some of the volume within a bullet jacket. By adjusting the position and ratio of core to ball, the balance of a bullet can also be adjusted, making it possible to use long or light bullets with standard twist rates of barrels. For example, a bullet ball of proper diameter to drop into a .308 jacket (.25-inch diameter ball) will shift the weight forward if a short lead core is placed on top of it. Thus, a long jacket can be used to make light bullets, much lighter than would be possible without using a shorter jacket or having too much open tip area, without the ball. 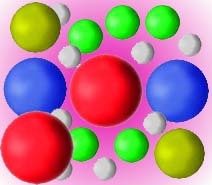 Lead displacement is the weight reduction of a bullet for each ball used to replace an equal volume of pure lead core. The ball can be compressed in the jacket before the lead is inserted and seated, if you use a core seating punch that fits the jacket ID near the bottom. The standard punch usually fits near the mouth. The jacket usually becomes thicker walled near the base, and thus the ID becomes smaller. Sometimes, it is possible to use the core swage die's external punch to seat the ball. The ball should be as snug a fit as possible in order to fill the jacket and avoid shifting to one side, which would put the bullet core "off center". If you use smaller balls, which do not completely fit into the jacket ID, you can center them by using a core swage punch that has a 45-degree point, which creates a mirror image socket in the end of the core. The ball will then automatically find the center of this conical shape cavity when you place the core and ball together in the jacket. The punch typically is made as an INTERNAL CSW (core swage) punch, with 45-degree conical point. The core can be used without a ball, as well, and the conical cavity has no disadvantage if used without a ball, facing up toward the jacket mouth. Or with a ball set on top, to make a polymer tip! The lead core can be stacked between two or more bullet balls, to shift the center of gravity as desired. Or the core can be made in two short sections, first one section for the base, then a bullet ball, and then the other lead core section. By changing the ratio of the two core lengths, you can move the location of the ball and shift the balance easily so that the bullet will be stable in a wider range of rifling twist rates than if it were filled with a single core density. The bullet balls, available in packages of 1000, can also be used for bullet tips. By making the opening of a bullet just smaller than the ball diameter, any size of ball can be used that will fit within the jacket. This makes it possible to make "ball bearing" type tips, which roll the bullet up the feeding ramp, into the chamber, for more reliable feeding. The linear polyethylene polymer from which the bullet balls are made will elongate or flatten under pressure, but will tend to spring back to the original shape when pressure is released. The balls cannot be used to make a very sharp pointed tip, since they will go back to a somewhat oval shape after the pressure is removed. If they are pushed into too sharp a point, in fact, the material will tend to crack or deform rather than smoothly spring back. To make a small tip, use a ball that fits just below the jacket end and allow slightly less than half the diameter to protrude from the jacket. A .125-diameter ball (1/8) can be used for a small tip on a .224 or .243 bullet. 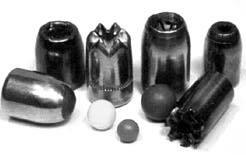 A .1875-diameter ball (3/16) can be used as a small tip on a .284 or .308 bullet. There is no absolute rule as to what size you have to use...anything works if it pleases you. The closer the ball diameter becomes to the jacket ID, the more blunt the tip will be. Ultra-Light, high velocity bullets are fun to build using one or more bullet balls in the same jacket, topped with a small lead core to give the bullet some forward mass and restore accuracy. Most light weight bullets are short and tend to tumble, but the polymer filling topped by a bit of lead will help keep the nose pointed forward, and the shank can be just as long as any other weight of bullet. This allows the bullet to be loaded into a case neck properly, to fit the chamber or leade of the barrel, and to align correctly in the bore. The long, arrow-like bullet will tend to fly straighter than a stubby conventional light-weight bullet (although light weight means low BC, so the bullet will be affected more by cross winds and will drop more quickly than a heavy bullet). Ultra-Lights can reduce recoil in light weight revolvers and provide spectacular short range effects on some targets, while reducing penetration and richochets. Remarkable high velocity loads can be developed, such as a 2,000 fps .38 Special in a 2-inch barrel revolver, using a 50 grain .357 bullet that appears physically the same size as a typical 158 grain bullet, with good accuracy at shorter ranges (air resistance will rapidly slow a large diameter light weight bullet, so the range is limited). 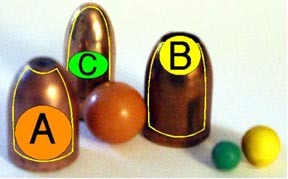 Other techniques to make ultra-light, high velocity bullets by filling the volume of a long jacket with light material require measuring out powders or pre-cutting light metals, a typically slower and less precise operation than dropping a precise weight plastic ball, or two, into the jacket. Speed, accuracy, convenience are all good reasons to use the polymer balls.